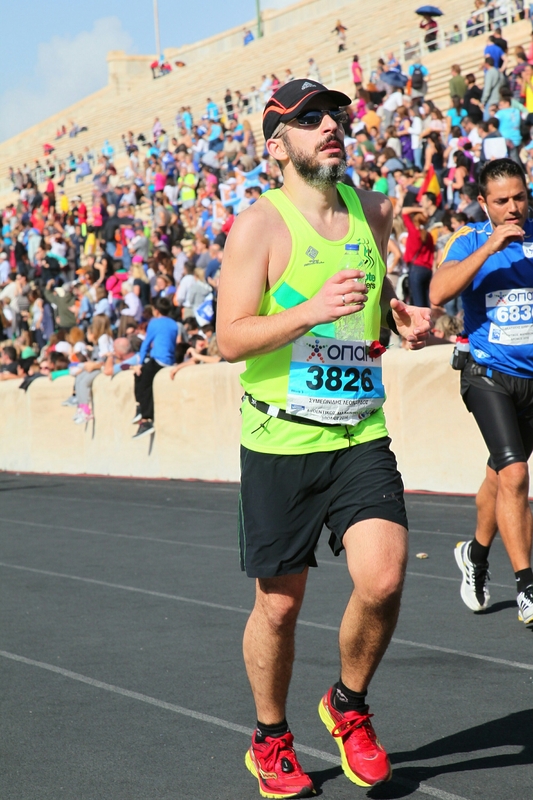 Racing | Running the Marathon. Again. I remember leaving home and walking to the underground station, the plastic bag with my kit and bib number slung across my shoulder. At 5:50 on a Sunday there was hardly another soul on the streets, but there was already a couple with similar bags on the train platform and more arrived by the minute. On each station more and more people in running gear and the same blue bag boarded the train, silent for the most part, although I did manage to extract a nod and a smile from a couple of them (hey, l wasn’t on the London Underground, so I was determined to acknowledge the people I was going to run 42.2km with!). 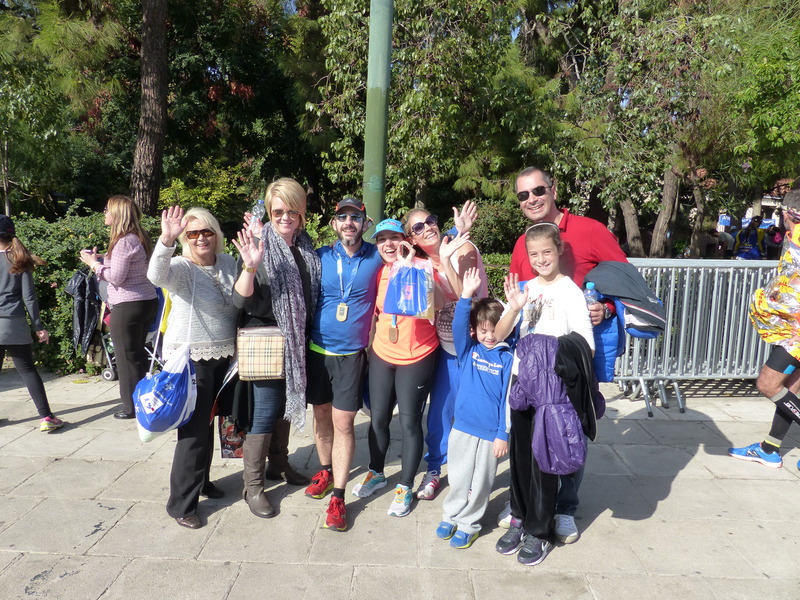 By the time we got to Syntagma Sq (one of the points at which we would board the coaches to the starting area) the train was full of runners: Exiting the station we were a stream of blue bags – this photo really doesn’t do justice to the sight! The organisation was even better than in 2011, with volunteers at the top of the escalators and along the very short walk to where coaches kept arriving, picking up runners and setting off for Marathon, 40-odd km away. It was obviously much busier than 2011 though (it turns out there were double the number of runners in the marathon race) and it took about 5′ to board a coach, which is still pretty good! Eventually the time came for us to get in our starting blocks, the athlete’s oath was sworn (we love our bit of ceremony in Greece as well!) and we were off! Through a combination of the traffic around me and a conscious decision to take it easy, the first km was appreciably slower than my target time for the first section, but I didn’t mind at all: it was developing into a hot day and running in a group of sweating runners on a road that was drying didn’t help one bit! In fact I remember that it was somewhere there that I started talking to myself, like I would to Demi when we run together: little mumblings of assurance that this was the right pace, advising myself to take it easy to begin with and see how the day developed: In any other gathering I’m sure I’d get many strange looks, but marathon runners are a strange sort, and talking to ourselves is one of our more minor eccentricities! I also started singing a Neapolitan song that had become an earworm, inwardly for the most part. My pace began to pick up a bit in the second and third km, but I was always there to keep myself in check with little mutterings of “there, no faster than this now”; or “wow, ease back a bit, it will be a long, hot day” etc. The fourth km went past, we turned left for the loop round the tomb of Marathon (where the Athenian dead of the battle in 492 BC are buried) and the first water point. On the road to the tomb there was greeting of runners coming the other direction (i.e. had completed the loop and were heading back to the main road) and a bit of banter, but then it was our turn to head back on to Marathonos Av and continue towards the next village of N Makri. I was still very happy with my running, keeping a reasonable pace and I completed my first section (0 – 10km) marginally slower than my goal, but very relaxed about it. On the undulating section that followed (10 – 15) I was faster than I had aimed to be, primarily because I expected it to be all uphill and had set my target pace accordingly. Still, I continued to coach myself and mumble advice regarding taking it easy, but looking at my splits now, I see that on the genuine uphills I went (on average) at the pace I had set myself – perhaps 2” per km slower. As I entered the 16th km, I remember taking a lot of heart from the thought that I had completed over a third of the race already and I was feeling very relaxed, relatively fresh and in complete control of my pace! I had to make a quick pit stop behind a tree (first time ever in a race! ), but it wasn’t a big deal in the scheme of things and I could see the people I had been running with a bit further down the road, so I knew I hadn’t lost too much time. Besides, given the heat, I wasn’t really going to push myself for my target time, although I felt I had a good race in me. The 16th km had the most demanding hill yet, but that meant that the line of warm bodies thinned out a bit and a most welcome suspicion of a sea breeze blew over the coast and up to the road we were climbing. That section of the route is lined by pine trees and is genuinely beautiful; there must also be eucalyptus trees in there somewhere, because I could clearly sense their distinctive smell. I find it grows stronger when there is humidity in the air. I have mixed memories from that smell: My first memory of it was from summer camp in Athens, which had an athletics track the back straight of which was lined with eucalyptus trees. I was never much of an athlete at school (I enjoyed playing some sports like tennis and volley ball, but always purely for fun, which meant the PE teachers had given up on the likes of me and concentrated on those they considered having team potential) and running was my absolute nightmare! Anyway, evenings at the summer camp were dedicated to sports, and the smell of the track’s eucalyptus trees accompanied my feelings of exhaustion and inadequacy as I desperately tried to complete a second lap around the track at a completely inappropriate pace. 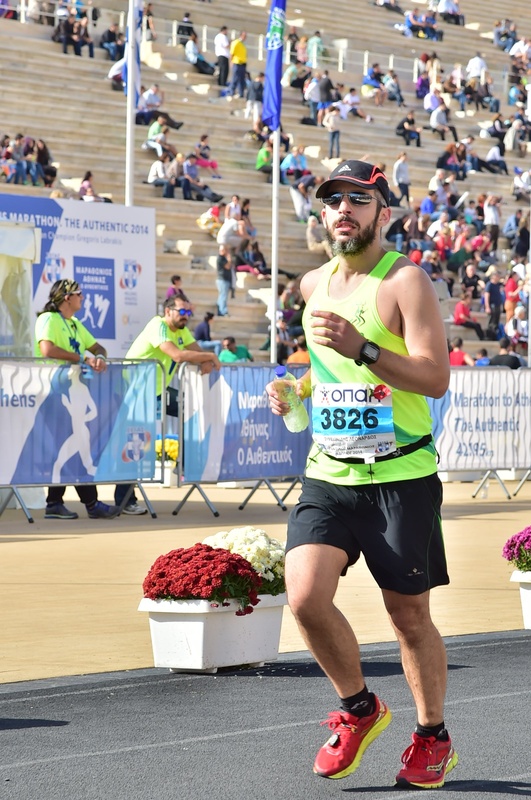 I had since made my piece with that smell (summers on Greek islands saw to that) and coming up to the mid-way point of my fourth marathon feeling strong, even the memories of me struggling round a track many years back felt part of the collage of what makes me a runner. But I digress. 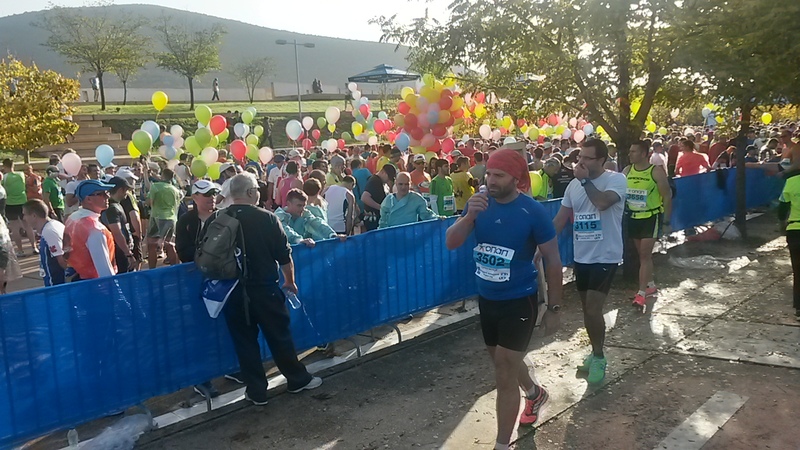 I have said nothing so far about the other runners on the course, the many spectators out to cheer us, some waving flags, others handing out little branches of olive trees, all shouting, all encouraging us to go further. The municipalities on the marathon route hold short (1,000m) children’s races before the first runners come through and they and their families had stayed out to watch us, medals hanging from their necks, adding to the atmosphere. The following two km were downhill and then (from the 18th) the slow climb to Stauros junction, at the 31st km started! I was surprised to see that what I remembered as a long hill was in fact broken by the odd level section, but even so, my pace slowed more than I had planned it to, and at that point I felt the first pangs of disappointment as I had to acknowledge that I was going to miss my target. Still, with a strong last section (11km downhill) I was on for a respectable PB, which given the conditions I’d gladly settle for. The first pangs of discomfort came a bit after half way point. Niggles behind my knees, my hamstrings began feeling tense and – eventually – cramps developed at the tops of my calves. I tried adjusting my running, lifting my knees a bit more (it had worked in training), varying my pace a bit, but in vain. The pain kept getting worse, so on the 25th km I had to stop by a First Aid point and ask for help. They gave me some cooling gel to rub on my calves, took my number and sent me on my way. I realised after the race that I was diluting my High5 electrolyte tablets too much: I mixed half a tablet in each 500ml water bottle given out, instead of a whole one that was closer to what I was used to and what High5 recommend. The gel hardly provided any relief and so it went, running, walking a bit, stopping at another First Aid point and so on to the 31st km and the top of the hill. But it was all going to be downhill from there, surely I could manage that? You know what it’s like when you race falls apart, when what you have set out to do is lost and then, minute by agonising minute, you see even your “settle for” goal slip by and – try as you might – there is nothing you can do but try to hobble along after it, only to break down into a walk a few hundred yards later? You enter a little world of your own, a parallel run: those runners that pass you looking strong (anyone who can continue running looks strong to you) belong to a different race, and that is the race the spectators are cheering. They are cheering the athletes who overcome the discomfort and continue running, while you (in your own head) have stumbled and are about to pull out. The downhill brought no relief and despite a stop at a third First Aid point, my discomfort (can I call it suffering yet?) only increased. The pain behind my knees was so bad I couldn’t even walk and when I stopped and sat down on the pavement to seek some relief in folding them, it only took them a few seconds to begin hurting again so I had to get up, pretend to stretch (I was too tense for anything to actually stretch!) and limp along. I can’t recall everything that went through my head, but l know it wasn’t pleasant. I hadn’t stopped mumbling to myself throughout, part encouragement, part complaining to no one in particular, but when I heard my own voice telling me I couldn’t take any more, I knew my race was over. I’ve read the experiences of a number of runners who had painful races but at the crucial moment dug deep, found the strength within them and refused to give up. It was nothing like that for me: By the 37th km (5.2 measly kms before the end and deliverance! ), I felt completely drained, physically and emotionally, and I had no alternative but to find a marshal and pull out. I was close to tears and wondering what sort of a horrible person I was that after the past 5 months this was going to be the one thing to reduce me to tears: not finishing a race for pity’s sake! 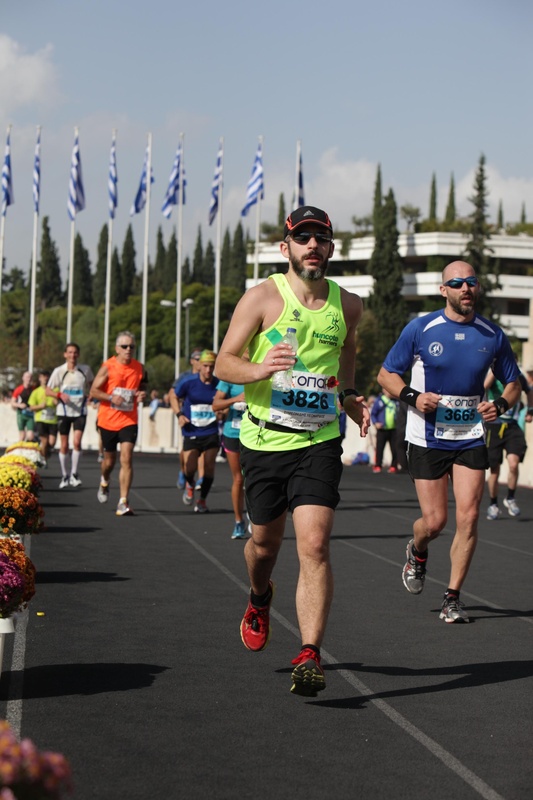 There was no rage against the dying of the light, no Will to tell heart and nerve and sinew “Hold on!”, just a little sadness that my first DNF had to be in Athens, in “my” Marathon. A lot of self-pity for my pain and a foregone debate on whether I would still allow myself to wear the finisher’s T-shirt (shame, because it was a nice one this year). I think it was not entering the Panathinaikon Stadium I minded the most and the practicalities of how I’d meet up with Demi and everyone else who might still be waiting (my phone had already given up the ghost). 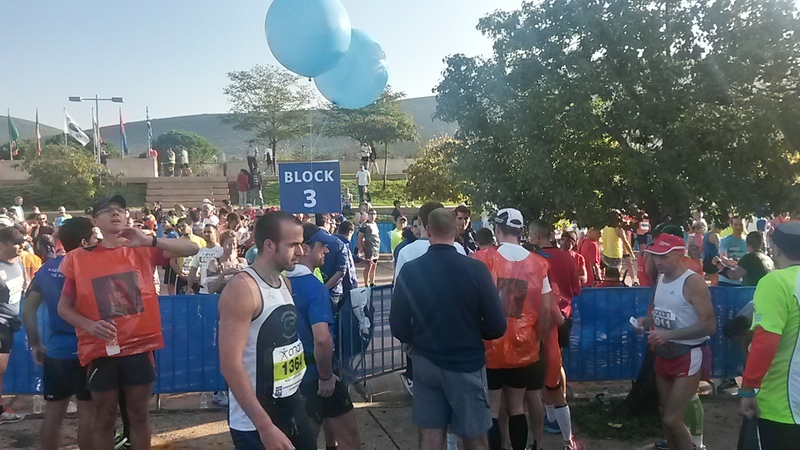 My hobbling towards the marshal became a bit less slow and – more from habit – I picked up a bottle at the water station at 37.5km rather than stopping. I put the two half-tablets of High5 zero l had left in it and carried on running. 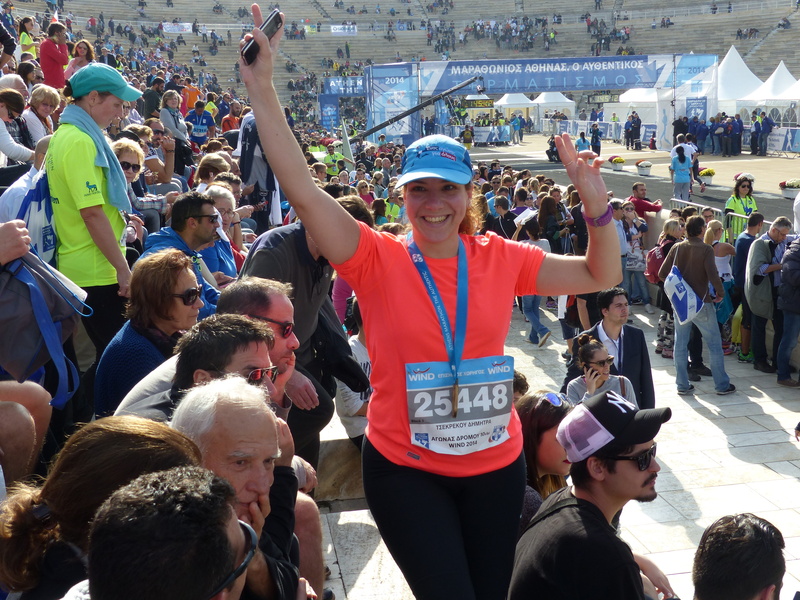 The talking to myself gradually changed tune, the pain became manageable and as I emerged from Pheidippidou Str (the last uphill on the course), I was declaring to the world (in Greek) that “there is NO WAY I am not going to finish this! Not a chance!” and picking up pace to something resembling my overall target race pace. I had began overtaking people again and that was another boost: I was not in the parallel universe any longer, I was back in the race: Half an hour late, but back in it nonetheless! Even so, I had to make sure I didn’t make the mistake of going full out – I didn’t know how long the relief would last for and there were still 3 km to go, but I felt I was running properly again! And it was a wonderful sensation! Past the War Museum, left down Herodou Attikou Str and it looked like the most beautiful road in the world! 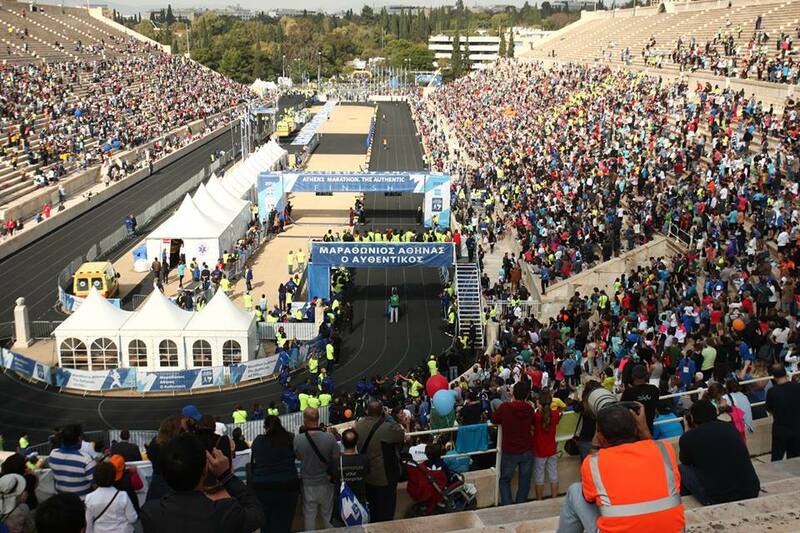 A downhill straight lined with trees and people four deep, all cheering us, crowding onto the race course as it crossed Vasileos Konstantinou Ave and into the Stadium! And what a beautiful stadium it was, from the first glimpse of the marble structure over the trees, to when it was revealed in its full glory as we passed under the arch signalling the end of the 42nd km! I completed the race in what felt like a fluid fast run, but what video evidence later revealed to be a tensed up jog. As I crossed the finishing line I heard my name been called and there was Demi and her mother, my sister and Niko and a family of good friends who had come to see Demi run the 10k race on the day (also finishing in the stadium) and had stayed on to watch me finish. l followed the route round the stadium to where we were handed our medals and then out to collect my bag. The cramp returned as I came out of the stadium and I had to stop a number of times on my way to the collection point. lt was only 2 or 3 minutes walk away, but it must have taken me at least 15 to reach it. l kept asking the volunteers where we collected our bags from, hoping one would say “why Mr Symeonides, we have yours here”, but the answer never changed. l had a few choice words for the organisers’ decision to hide our stuff at what seemed like the far end of nowhere, but of course it was the right decision: not only did it avoid congestion at the exit of the stadium, but the short walk eventually got rid of the pain and I presented an almost respectable sight when Demi, Alexia etc met me. 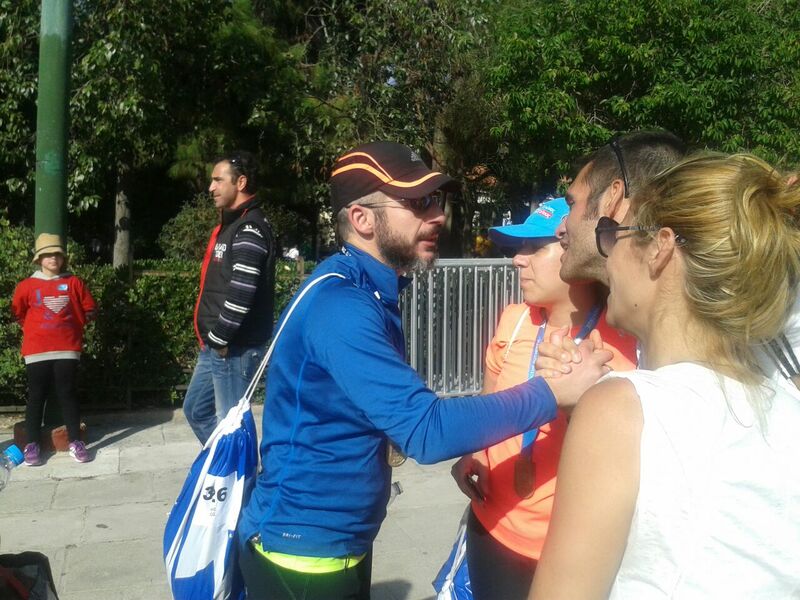 They all seemed quite relieved to see me, walking and alive and everything, and I was greeted to another of the completely undeserved hero’s welcomes that is the real reason I am addicted to marathons! But I too was so pleased to see them, relieved to have finished despite it all and glowing in self-satisfaction for my persistence and subconscious stubbornness that l didn’t mind one iota about the slow time or the pain along the way. “These things happen” I reasoned and they all add to the collage. It’s hard to know what to write about Sunday’s race: looking back I am presented with such an overwhelming mix of emotions, memories and sensations… some are very unpleasant, others – the majority – extremely happy… I really do not have the words to share the experience! As most of you will know by now, I finished the race, but at a much slower time than I was hoping for: At 04:12:something, it was 28′ slower than my PB and 21′ slower than my course best – which also happened to be my first marathon ever! It was a very hot and humid day, an hour before the race the temperature was 20o C with 88% humidity and it just kept getting hotter after we left the coast and headed into the built up areas… While I was feeling good, running well within the limits I had set myself and taking on plenty of fluids, I started suffering from very painful cramps high in my calves from (I think) the 25th km onwards: I had to do a lot of walking, stopped at three First Aid Points along the way for cooling gel / spray and – at one stage close to the end – just sat down and folded my knees because any other position was just too painful! Having given up on salt sticks during my training (you will remember that they did not agree with me), I relied on High5 zero tablets for mineral supplement, which were great, but I think I had diluted them too much for the demands of such a hot day. Proof that when I eventually put two half tablets in the last bottle at the 37.5km water station, I was very quickly able to run again, picked up a decent pace, covering the last two km appreciably faster than my target pace! If only I had thought of it sooner, and what an idiot I feel for not trying it earlier! But even having just written that paragraph, having relived all the negative experiences of the race, having reminded myself that what I trained so hard for ended in, let’s face it, failure (after all, I didn’t train or a 4h plus marathon, nor to walk with a grimace of pain), I still can’t wipe the wistful smile from my face at the memory of the day… It is common for runners who’ve had a bad marathon to vow to not run another, only to change their mind a few months later as the memory of the pain subsides… Instead I would run Athens again tomorrow given half a chance, under the very same conditions (but with more High 5 tablets)! There is probably an element of bias, I accept. After all Athens was my home before Preston or Huncote, Marathon (the starting point) is where I spent most of my summers building castles in the sand, learning to scuba dive and free diving. But still… I’m not one of those Greeks who sees their country bathed in a golden light and lament every moment they are away, so it’s not all the effect of nostalgia! I genuinely appreciated the course much more this time round, I felt much more in control of my running than other times, I loved the fact that not only were there water stations every 2½ km, not only did they give out water bottles instead of those silly plastic cups you get in most races, but you could call out to the volunteers and specify whether you wanted your water bottle with the cap on or off! To say nothing of the usual assortment of bananas, sports drinks, gels, and – oh, luxury of luxuries on such a day – sponges dripping with cool water! 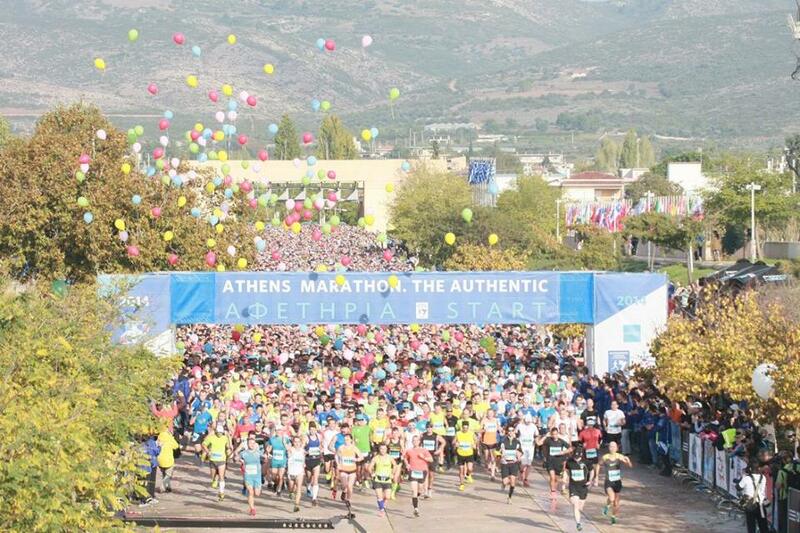 There is also something about how the Greek public (and I include here non-runners) sees their marathon… There is a discreet pride about it being “the one” and it being such a well organised and well run event, even by international standards (a rare occasion of Greek organisation being pretty damn good!). 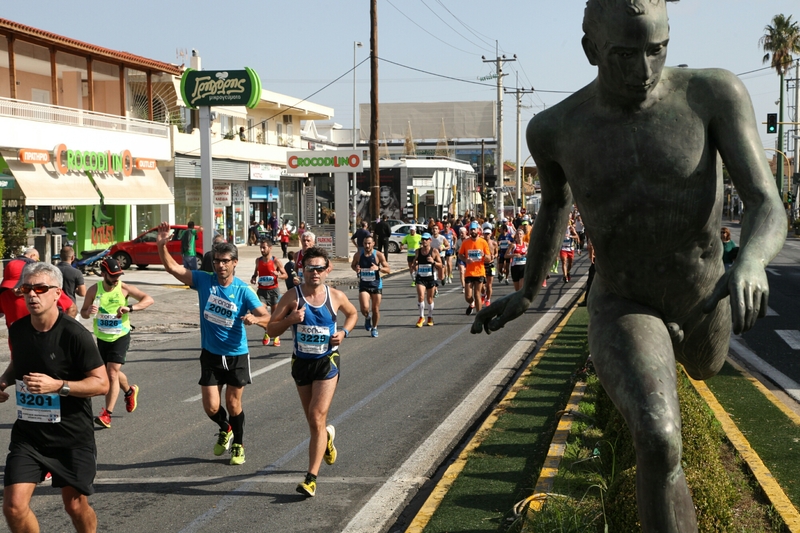 Also, as it is a point to point race from a relatively well known coastal village outside Athens, it’s easy for everyone to get an appreciation of the distance involved (“you ran here from Marathon?”) and I think this shows in how people view the runners and the event. And there is one final thing… It’s a genuinely inclusive event, costing only €40 to enter (€20 for affiliated runners!) for the mid range entry package and entries don’t close for around 5 months after they open in March. So none of that staying-awake-till-4am-to-enter-the-ballot-and-then-find-out-six-months-later-that-you-aren’t-in-it-anyway, which we seem to consider normal for London! But I digress… The point I am trying to make is that I have become very, very fond of this race: I loved it the first time I ran it, when I had exceeded my expectations; and I’m absolutely hooked now, when I had a terrible race, went through a lot of pain and on the 37th km thought I couldn’t take any more! 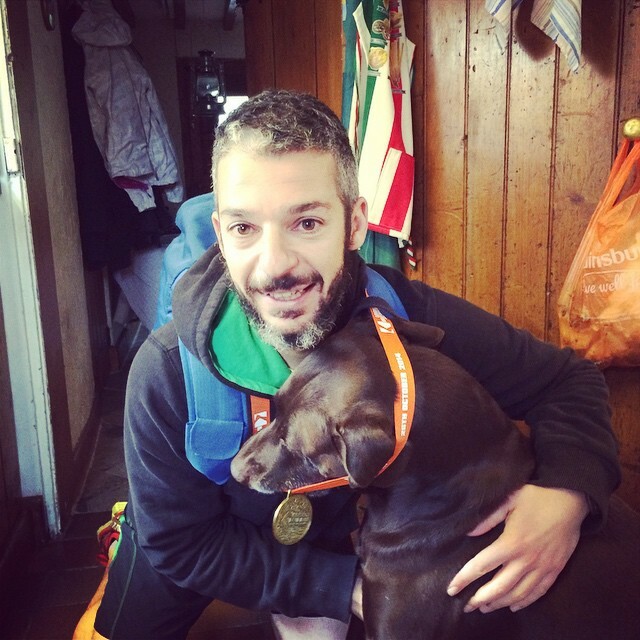 Although this isn’t what I – or I suppose you – expected me to write about when I started this post: Instead of a description of my run, it’s ended up an outpouring of love for the race that gave me so much pain! Which I will do in the next few days with a more factual description of my race. Bye for now! The night before the day after! But the day was surprisingly full, and I make no excuse for getting as much rest as I could. 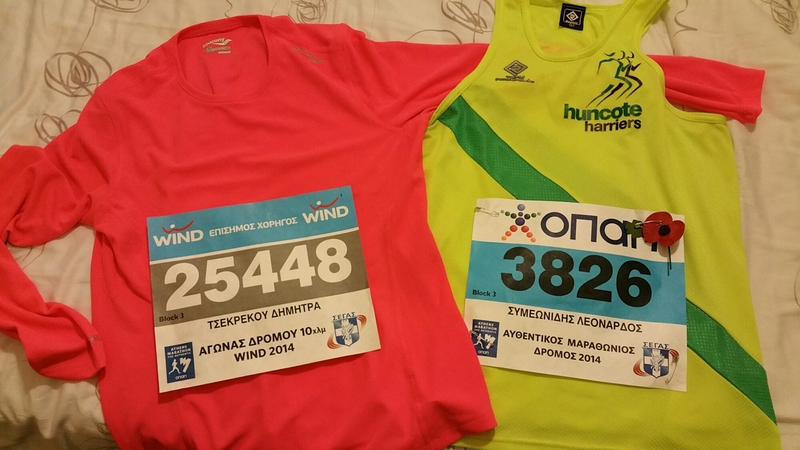 .. so just a brief “have a good’n!” to everyone one else running in Athens tomorrow (5, 10 or 42.2k) and you’ll hear more of me from the other side! Tapering did you say? 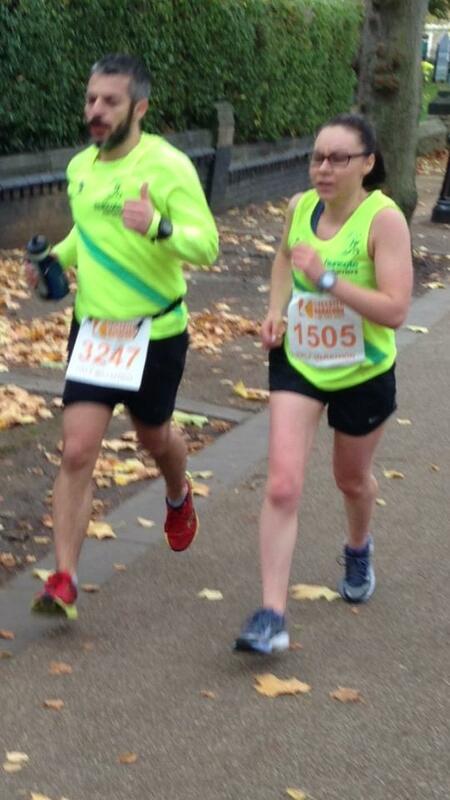 Leicester half 2014! It didn’t quite work out that way: the first 2.5km of the course were downhill and I let myself go a bit too much and for a bit too long: and to make matters worse, after about the 3k mark, I spotted a speed of Harriers (I’ll settle for that as the collective) in the distance who had started ahead of me in the race, so… I would be lying if I said that pacing considerations weren’t hampered by a desire to edge closer to them… After seeing their bright vests appear and then vanish again through the throng, I eventually caught up with them at around the mid point mark, but the impact of the faster-than-planned first half was showing, so any thoughts of still running this as a progression run and accelerating, and then upping the pace again 5k later went out the window! In the event Chris and Andy were out for a relaxed race (I never would have made up the distance otherwise), so after staying with them for a bit, I eventually went past and – mindful of the uphill last mile (and the small business of the upcoming marathon) – I tried to take it relatively easy for the remaining 8km, not digging deeper than I had to and using whatever downhill to catch a breath. I was impressed by Sarah though (who I occasionally called ‘Claire’ in the race for no apparent reason! Sorry!) who also detached herself from the speed of Harriers and stuck stubbornly to my shoulder! As the race went on we traded places a few times but she set off up the New Walk hill faster than I did, which I think is what made the difference in the end: For all my faults, I’m reasonably good at judging the pace up a hill (it should be slow! 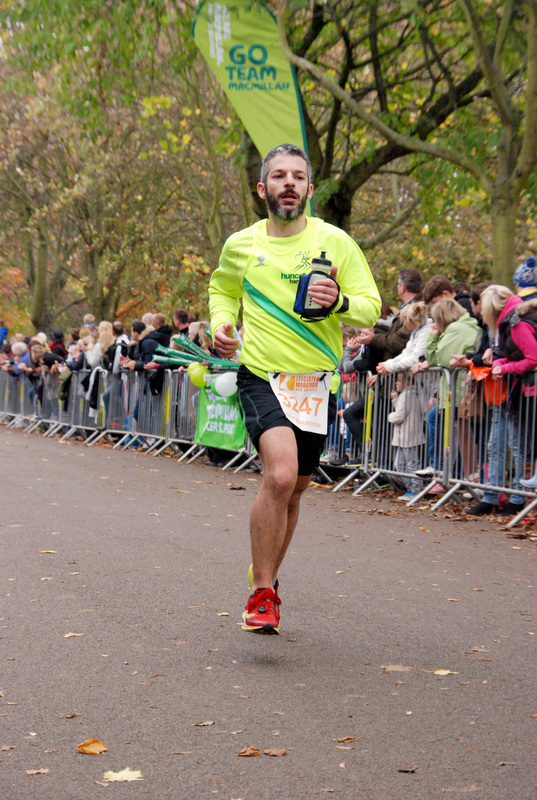 ), so I had enough left for a push over the top and a decent 500m strong run to the finish. Where I promptly folded in half and gasped for dear life, but that’s ok, that was on the other side of the finish line! 🙂 My (chip) time was 01:40:39 which is a PB with a decent margin, which I’m very pleased with, especially as I didn’t set out to blast this. So I don’t begrudge the 40”, I see it as an opportunity to break the 1:40:00 mark on another occassion. What I’m less happy with is my lack of discipline at the start: something I will need to be more careful with in Athens. I could also tell the lack of strength and core training, I felt my abs and glutes complain a bit after the 18km, which isn’t great news with a full marathon coming up in less than two weeks’ time! On the positive side, I did much better than I thought I would overall, I was pleased with my uphill running (ok, not the hilliest course in the world, by a margin, but the last 3km were all uphill, the New Walk mile in particular was the course’s sting in the tail) and with the fact that I still had enough in the tank for a very strong last 500m culminated by a final sprint. But the highlight of the day was once again being part of such a great running club! 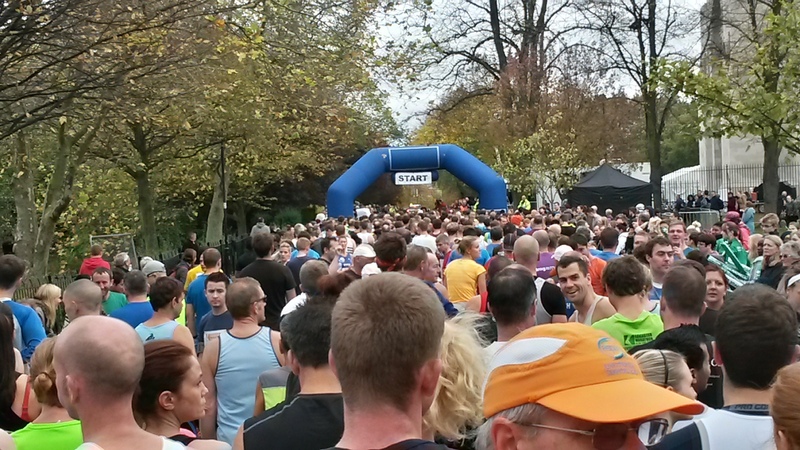 I arrived at Victoria Park alone (Demi was looking after guests at home), just one of over 3,000 runners, and within minutes I was in a huddle of Harriers keeping each other company till the starting gun. And it didn’t stop there: I already mentioned that the first half of the race was haunted by a vision of a speed of Harriers in the distance and the other half was ran just ahead or just behind Sarah. But the majority of the Harriers I saw were lining the streets offering very loud support, many of them were cycling or walking around the route to cheer us over and again! It makes a massive difference to our running, perceived suffering and enjoyment of the day! And of course, once again congratulations go to the organisers, all volunteers and everyone involved with the race: I’ve run it two years in a row now and it’s becoming a favourite – especially the last stretch: yes, even the New Mile uphill but mostly the last few hundred meters along the tree lined Granville Road and across the finish line! So, full speed ahead for Athens now! I’m really pleased I ran the half at the point I did: it gave me an idea of where I stand running-wise (I love the absurdity of this phrase, so I’ll keep it! 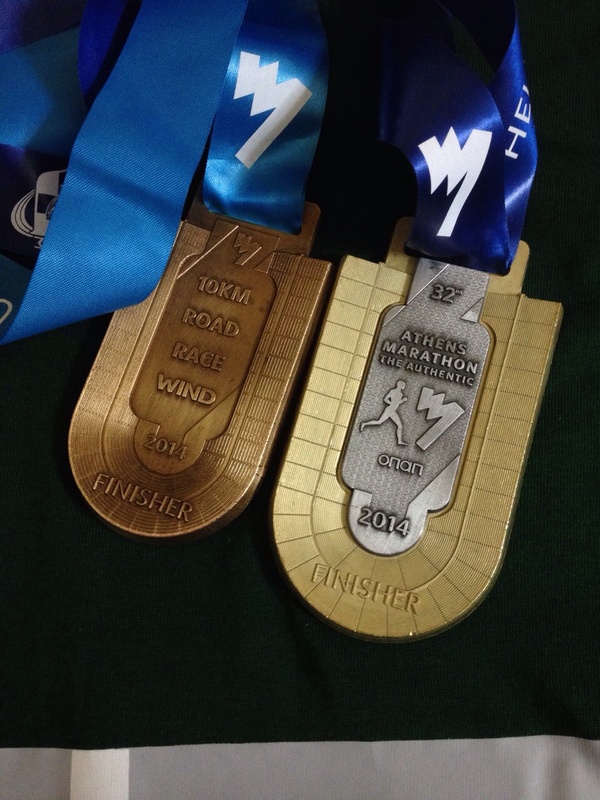 ), things I should watch out for and it reminded me that running is always different on a race-day. It also gave me a sense of confidence. Even if I’ll probably miss the target I had set myself when I started my training, I am still in the race. I’ve done all the long runs I’m going to do, I’ve balanced work etc. the best I could and have come through all the surprises, upsets and spells of self-doubt that past few months had to throw at me faster than I was this time last year, stronger and more self aware. 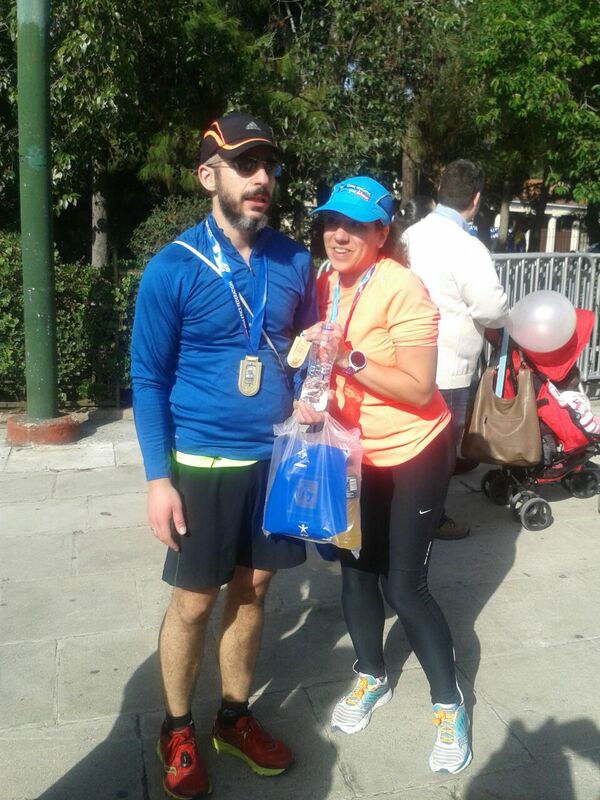 I’ve no idea what will happen in Athens (you can never take even finishing any race – let alone a marathon – for granted), but – all things considered – I’m happy with my prep. Bring it on!!! What a wonderful weekend this was! Leicestershire, as most of Britain, was basking in a lovely summer and we spent it lying by the gym’s outdoor pool, trying new recipes from our low carb recipe book (aubergine-wrapped lamb meatballs anyone?) and of course running ourselves to the verge of heat exhaustion on Sunday morning! Beautiful! As I signalled in a previous post, the Leicester Big 10k marked the end of my Spring’s proper running, and now I am on a compulsory (but very welcome) holiday as the next big event is our wedding in Greece! It’s also a good opportunity to rest, do some cross training and wander the trails of the National Forest without worrying about specific sessions or interval durations. It was the second year running that Demi and I ran this race and it has most definitely become one of my favourite races! 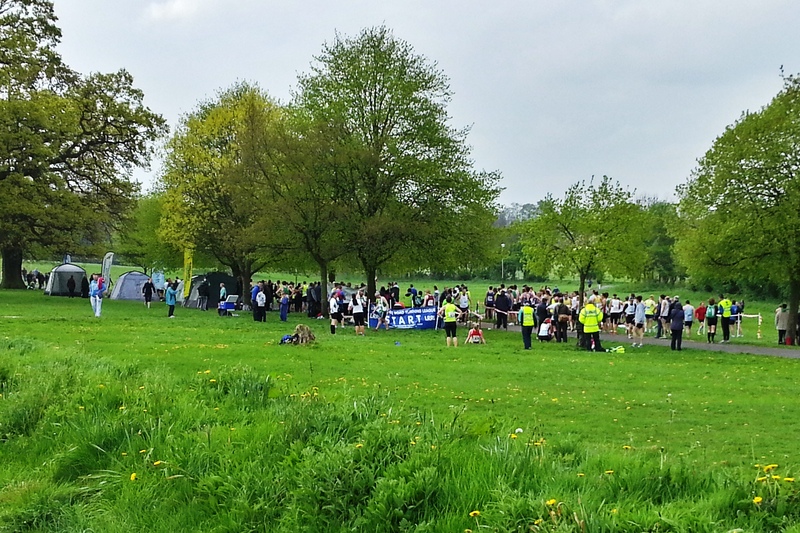 Abbey Park in spring is a magnificent venue for it and, while the course is made up of two small and two larger loops, the organisers have designed it in a way so as not to be tedious or monotonous at all (in fact in 2014 there were some tweaks to last year’s course that helped further in that respect). 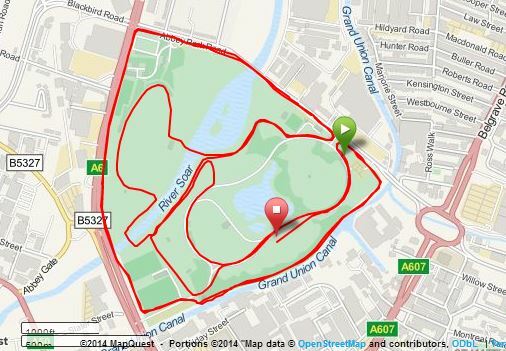 Instead they have taken advantage of the park’s may pathways to come up with a very beautiful and flat course that crosses the river Soar six times (of which twice in the park itself) and includes two straights by the Grand Union Canal. Speaking about the organisers, the organisation by Tempo Events last year had set our expectations for the day high, but they still managed to impress us: The marshalling was excellent with a lot of support for the runners and – despite the meandering route – there was never the least ambiguity as to the route; there was a water station at the end of the first lap giving out small bottles of water (rather than silly cups) and the design of the route meant we passed it twice (an absolute godsend on such a hot day). I took regular sips and poured a lot on my head to keep cool, but there was still water left in the bottle by the time I passed the station on the second lap. It’s also worth noting that when we eventually left the park after the last runner had finished, there were still plenty of cases of water left at the station, which means they had allowed for a more than sufficient amount (we tend to take these things for granted, but of course there is always plenty that could go wrong – and sometimes does!). There was a manned laptop just past the finish line where runners could check their provisional results on the spot (which we felt was a nice touch), a left baggage area, the ladies giving out t-shirts and goodies were very happy to exchange them for a different size, official results and photos were really online by Sunday evening (something that’s always promised, but rarely done!) and there was a general air of relaxed competence about the whole affair (e.g. the start was delayed by only a few minutes, but this was to allow for the last portaloo users to make their way to the starting line, which we felt was fair enough). 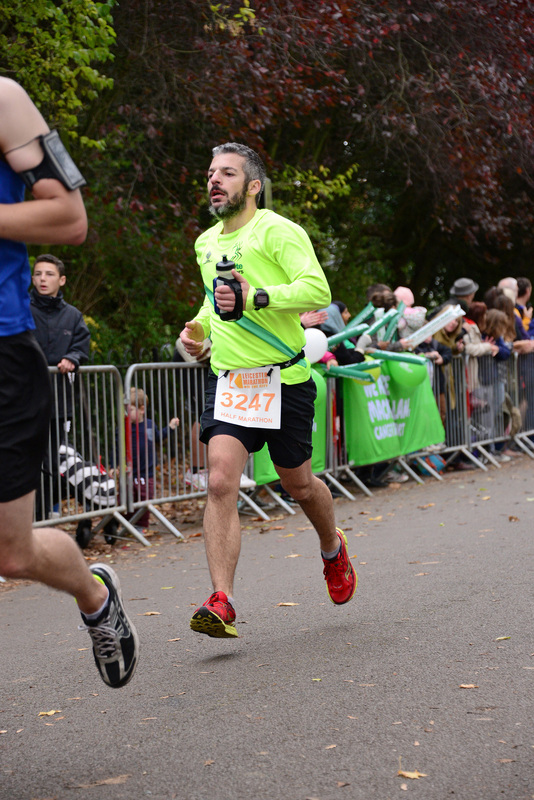 On the subject of race photos, I will order mine on Friday and update this post to include a couple of them after that. So overall very impressed with Tempo Events and their associates (Yourraceday.co.uk were the race photographers, Rainbows the charity partner who provided many volunteers and the whole event was sponsored by Western Power Distribution) and I will definitely look out for more of their races (the Whale Ale Relay sounds good)! On this occasion however there were so many runners starting ahead of me that despite the first couple of kilometers being run on the widest park paths, I could not find a quick way past them, which meant that at the end of the first kilometer I was 18” behind my race plan; by the end of the second I was 33” behind and there was still a crowd ahead approaching the narrow bridge. 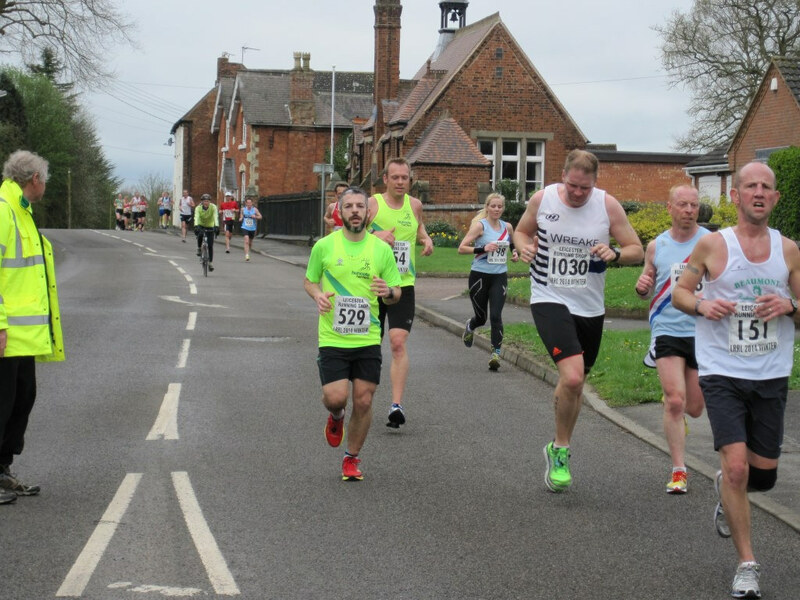 This wasn’t a race I was particularly desperate to do well in so I decided to run it at a tempo pace instead, enjoying the route, the sense of occasion and protecting my knee that had given me a bit of a scare the day before. 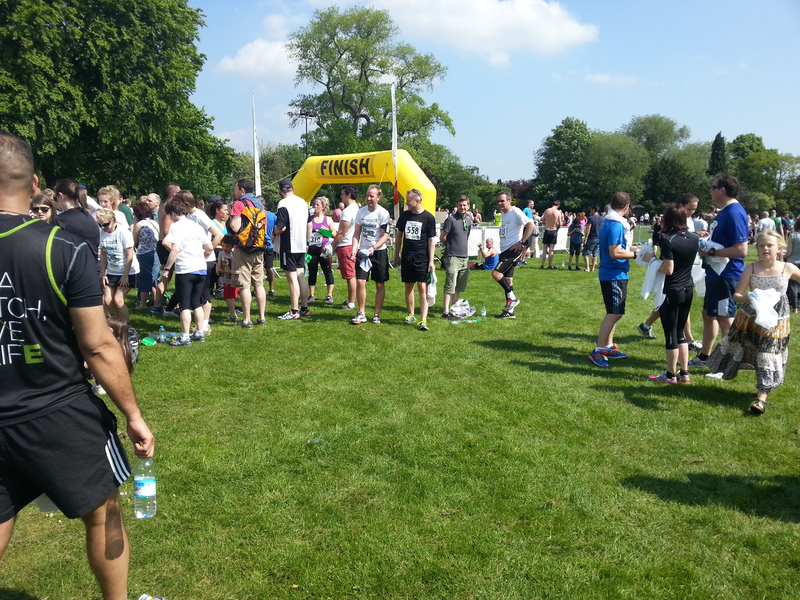 It was still a hard one in that heat, even if I ran 1:41′ slower than my PB. 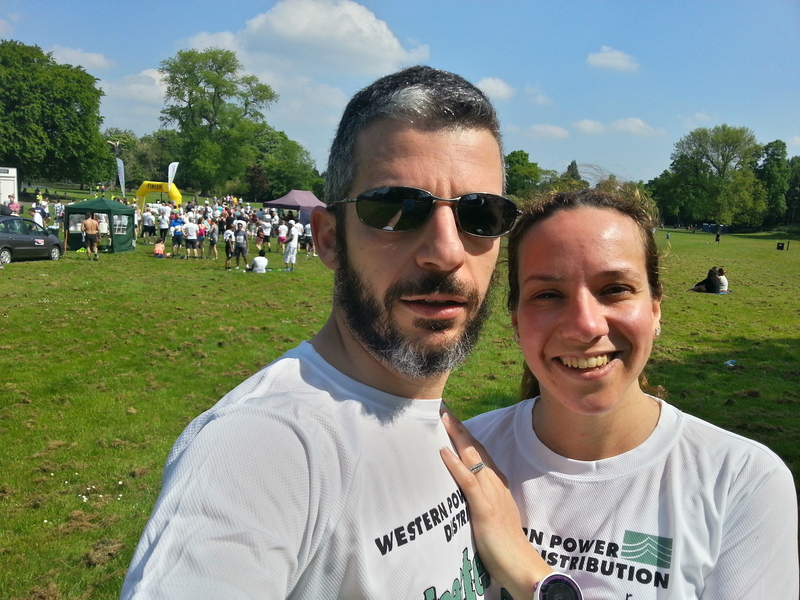 We stayed in the park for a while after the race finished, recovering in the sunshine, soaking up the atmosphere and taking the traditional selfies before heading back to our gym’s outdoor pool for some well deserved rest! And so the summer holidays begin and with them a whole new set of adventures… Proper training will resume in July, but in the mean time I will keep running – and posting. The annual Livingston Relays were on (a team event of 4 x 3m running, mostly in park paths) and, truth be told, I wasn’t particularly looking forward to them, despite the enthusiasm with which I had entered… That began to change on the day however and by the time I reached the start area, where all the club tents and standards were, I was slowly getting in the mood! I was a bit unsure about running the first leg, as that meant that I would have to endure the stampede at the start, but it didn’t turn out too bad either: it gave me the opportunity to get my run out of the way and enjoy the rest of the day and it meant I didn’t get lapped by any of the faster teams. Indeed, it felt more like a normal race, reeling in slower runners that had started ahead of me, enjoying some little duels of my own, while not getting in the way of the faster lot coming from the back. What I like with the 3m – 5k distance is that while it translates into 21′ of agony, it at least leaves me much fresher and energised for the rest of the day (compared with a half, or even a 10k race which, though they don’t leave me so much out of breath while I am running, I feel it for the next day or so). 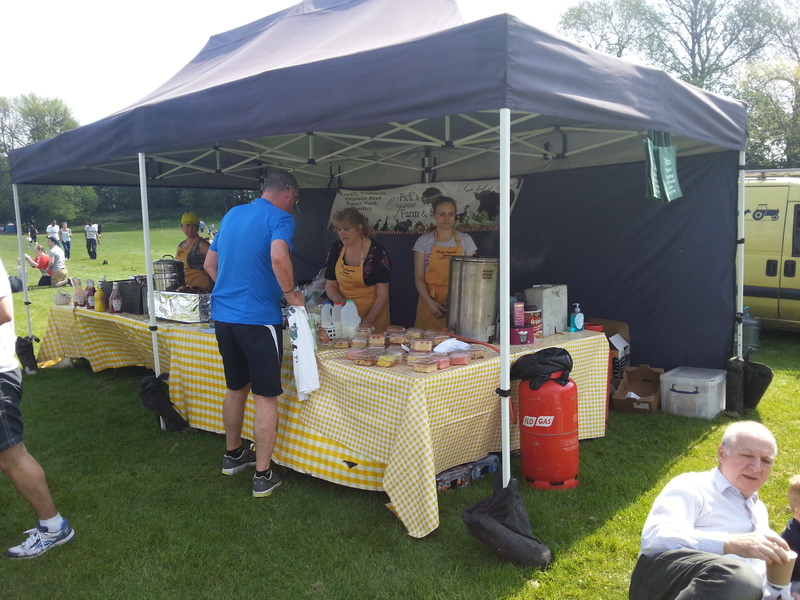 I’m sure the sunshine and party atmosphere in the park contributed to my buoyant mood greatly, and the suggestion that some of us meet at the beer festival at the Exchange was just the finishing touch to a great morning! Never one to turn down a gentle cooldown and hydration session, a great morning’s running was followed by an equally great impromptu evening out, getting to know a bit more of the people we run with every week or so, tasting some decent ales… Can’t complain really! So a massive thank you to all Harriers, but especially Andy Ball and Marie Wilford (men’s and ladies’ captains, respectively) for all their hard work organising us for the even, coming up with very well balanced teams (in terms of the runners in each team, but also setting up some decent races between them). Also Chris, Ledders, Trudi, Sam, Stuart, Lesley, Sarah and Jen for the night out. And as ever, Demi for… where do I start? 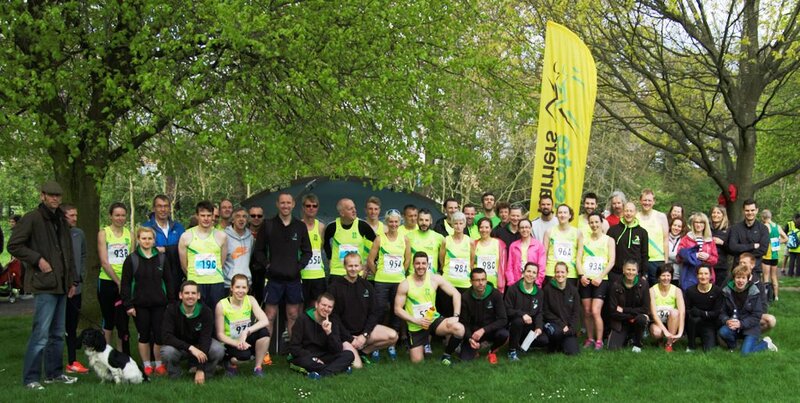 30 Harriers took part in the last of the Winter League races in Desford this Sunday past, which was a great turnout given that 10 of our most commited racers were in Ireland running the Connemara half and whole marathons, Graham was running the Manchester marathon (smashing his PB in the process! 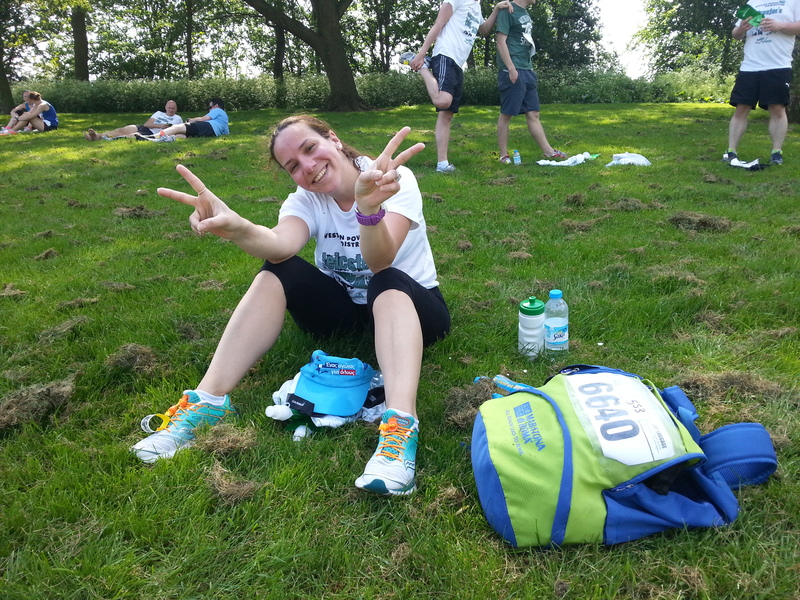 ), Nicki did not run the Sheffield half and many more were taking it easy, tapering for London on Sunday. After the setbacks suffered by the Winter League, which had two of its six races cancelled due to more stringent safety requirements and – what seems to me at least – poor communication between the organising clubs and the councils in the planning stages, it was great to see an event go ahead as planned. The marshalling left nothing to be desired, the route (along pathways and roads) was well marked and we while all roads had live traffic on them, I personally felt that appropriate measures were taken to make sure it stayed away from the runners who were kept safe at all times. Race results can be found here, while Harrier photographs here. But the main thing is that this blog is doing its job (even if I’m not sure exactly what that is!) and the journey to Athens is slowly but steadily picking up momentum! 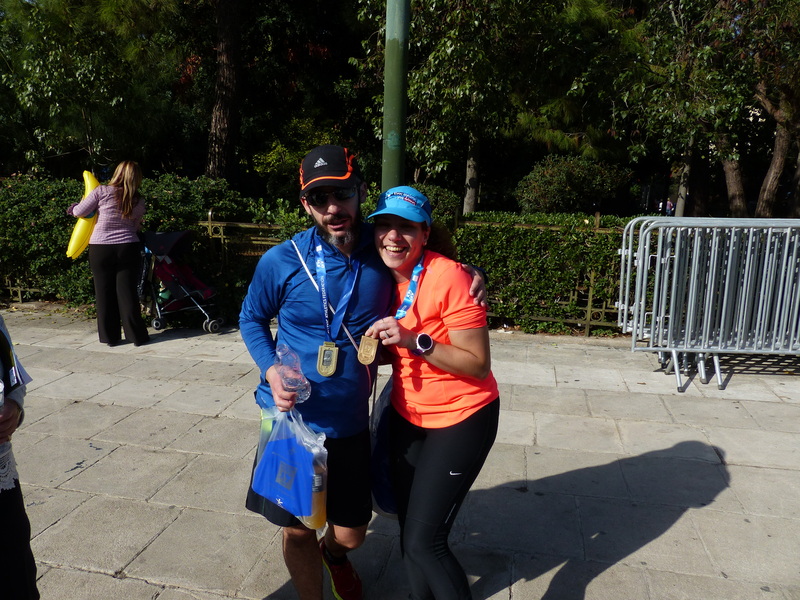 It transpires that another runner from the club, Karen, has entered the New York marathon (also in November, a week before Athens) and we had a good chat about training, programmes and the possibility of planning our long runs together, closer to the time. Anyone who followed my run2rome will know that consistency when it comes to going for my long runs is certainly not my strong suit in training, so a training partner to make sure you are out of the door when the programme says you should, will be of great benefit!